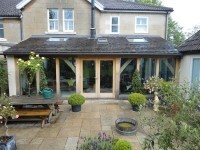 Glazing & Joinery Specialists for Green Oak Frames. Black Pig Frame Finishing Ltd. (Black Pig), is a specialist carpentry business working exclusively in the world of Green Oak Timber Framing. Black Pig specialises in the installation of face applied, fixed panel, double & triple glazed units and bespoke joinery in either oak or softwood to green timber framed buildings, made from either Green Oak or another suitable material such as Douglas Fir. We take a no compromise approach to our craft and endeavour to produce the best that is practically possible. We believe that the aesthetics of our work are as important as its function. 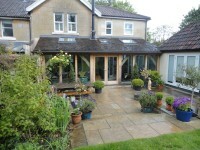 We want our work to complement your oak frame, while retaining the option of relatively straight forward repair or modification so that our work will last as long as your green oak frame. Before Black Pig started trading as a limited company in April 2006, our managing director Simon Ely had spent 5 years developing the basis of the system that we use today. Prior to that both Simon and Elliot Atkinson, his fellow director, had spent several years designing, making and erecting timber frames before choosing to work in the more specialised field of Frame Finishing. Black Pig is happy to work anywhere, within reason, and has completed jobs through out the UK and Eire, from Drogheda to Norfolk and from Jersey to Oban. We will consider working further afield; it is always worth asking! To date Black Pig has completed approximately 300 projects alongside many of the UK’s leading timber framers and we are always improving and refining our processes to use what we consider to be the best materials and techniques available. We aim to ensure peace of mind for both the client and ourselves. We love all our clients dearly but would rather not go back to a job after we have finished! Before considering a timber framed building in either Oak or a durable soft wood such as Douglas Fir, you must be aware that a green timber frame is very much a living, breathing entity. The heavy timber frame will keep moving for several years after completion and will require a certain level of care to maintain its integrity and aesthetic value. When you see an ancient timber framed building, you are looking at the result of centuries of good maintenance, built upon good initial materials and construction techniques. Black Pig fully understands both the requirements of modern buildings, and the properties of the materials we work with. The abilities and unrivaled knowledge of both Simon, Elliot and our happy band of carpenters are the result of many years of experience in both the construction of new, and the conservation of old, timber framed buildings. This experience means we have the skills to work with the unique properties that green timber exhibits and ensures that we can minimise their effects on the interface between our glazing system, the structural timber frame and the outside elements.